If you’re looking for a hassle free vehicle dock for your Moto Z smartphone, the Incipio Vehicle Dock Moto Mod is a great solution. It’s been a few months since the Moto Z smartphones and the initial batch of Moto Mods were released. Two new post-launch Moto Mods have now been released and our Incipio Vehicle Dock Moto Mod review takes a look at the second Moto Mod from the company, a vehicle dock with built-in charging and an AUX port. Pretty standard vehicle dock fare. The Incipio Vehicle Dock Moto Mod borrows the basic look of the Incipio offGRID Power Pack Moto Mod. It’s constructed of durable polycarbonate and features a smooth black finish. The signature Moto Mod camera cut out is present, although in this case, it’s probably unnecessary but probably does cut down on the weight of the vehicle dock. The front of the Moto Mod looks exactly like your other ones with the Moto Mod connectors near the bottom of the mod. About halfway down the Moto Mod are two release levers which are actually a very interesting and cool idea. When your phone is attached to the vehicle dock, simply wrapping your hand around it and pressing the two levers back cause a pair of small flaps on the front of the Moto Mod to push the phone forward, quickly and easily breaking the magnetic hold. Parallel to the release levers is your pretty standard vent mount set up. A threaded cup sits on the back of the Moto Mod and the vent clip ball sits inside of this and is then tightened on with an outer ring. The vent clip itself features a clamp which tightens onto your car vent by twisting a piece that is attached below the vent clip. 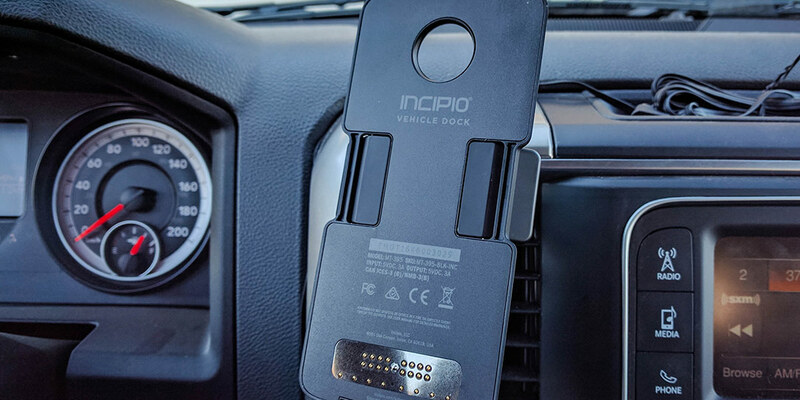 Incipio Vehicle Dock Moto Mod back view. Just below the vent mount setup is where you’ll find the USB Type-C charging port and an AUX port in case your vehicle doesn’t have Bluetooth. I’m not a fan of vent mounted car docks — the main reason being is that it blocks a vent, and I’ve never found them to be as stable as suction cup mounted car docks, but once installed the Incipio Vehicle Dock Moto Mod is very secure and the phone seemed to shake a little less than I noticed when it was on the suction cup mounted vehicle dock I had before. One thing to note: the vehicle dock doesn’t include a car charger or USB Type-C cable, both would have been nice additions to make a complete kit. Given most vehicle setups, a 3′ USB Type-C cable and car charger or car charger with a USB Type-C cable attached to it would be a great value add. As far as installation goes, it wasn’t really quick and hassle-free. It took awhile to get the vent clamps tightened properly on the vent I was attaching it to, and most of it was done by feel. I have a larger vehicle — a 2106 RAM 1500 — with plenty of cabin space, and it was still a bit awkward to install. I can only imagine how much more awkward it would be to install in a smaller vehicle. Once I had it connected to the vent, I connected a USB Type-C cable from my car charger to the USB Type-C port on the back of the Moto Mod. 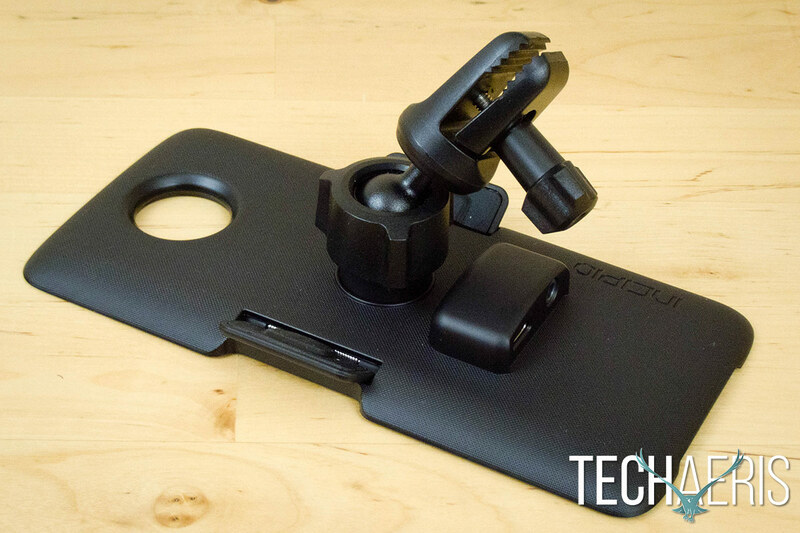 That being said, once properly installed the Incipio Vehicle Dock Moto Mod is super solid and well secured. Once installed all you have to do is remove the Moto Mod Shell or whatever mod you have on your Moto Z and place it onto the vehicle dock. The magnets take over and once connected the mod will start to charge your phone and launch Android Auto if you have it installed on your phone. The auto-launching of Android Auto can be turned off in the Moto Mod settings as well, but it’s certainly handy. A USB Type-C and AUX port are located on the back for charging and non-Bluetooth connections. As mentioned in the design section, when you reach your destination, simply push back the two release levers and your phone pops right off. The first time I dropped the phone while releasing it, but quickly learned that if you cup your hand around it and lightly hold the phone while you press the levers the phone will release right into your hand. 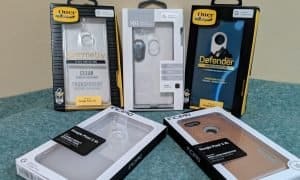 For something as simple as a car dock, I was kind of impressed with how much easier the Incipio Vehicle Dock Moto Mod made getting driving started. 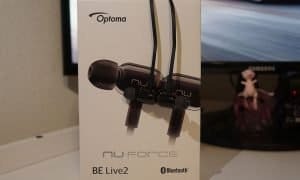 No more messing around with cables, no more launching Android Audio. As soon as I placed my Moto Z on the vehicle dock, the Turbo Power charging kicked in, Android Auto started, and I was ready to go. At $64.99USD, the Incipio Vehicle Dock Moto Mod is a bit more expensive than other vehicle docks. It is, after all, a Moto Mod and the convenience of being able to simply remove your existing Moto Mod or cover, attach it to the Incipio Vehicle Dock, and have it fire up Android Auto and start charging your device without having to mess with plugging in any cables is pretty handy. Unfortunately the dock is currently out of stock, hopefully Incipio will be getting some more in soon. If you’re looking for a hassle free vehicle dock for your Moto Z smartphone, the Incipio Vehicle Dock Moto Mod is definitely a decent solution. Easy to use, very stable once installed, solid construction. Auto-launches Android Auto, charges your phone. Definitely not a hassle-free installation. Doesn't include car charger or USB Type-C cable. If you're looking for a hassle free vehicle dock for your Moto Z smartphone, the Incipio Vehicle Dock Moto Mod is definitely a decent solution. 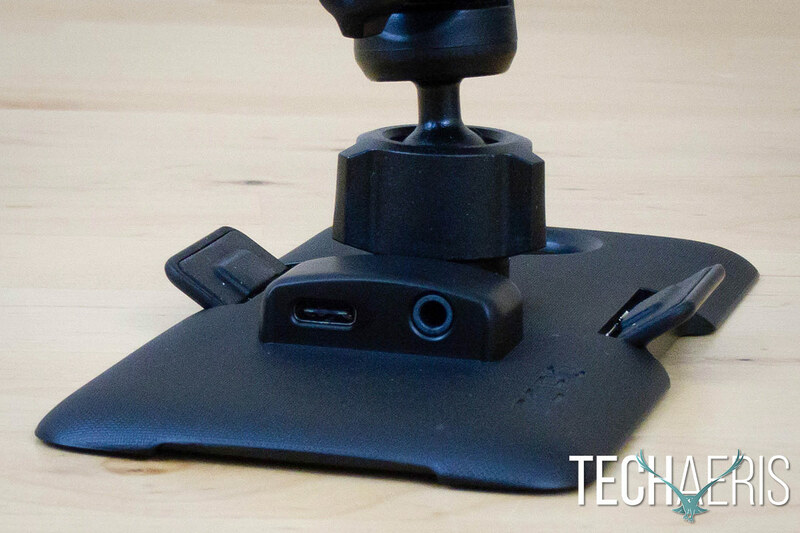 *We were sent a sample of the Incipio Vehicle Dock Moto Mod for the purposes of this review.